A 36-year-old man is contemplating his future from a hospital bed after causing a fatal accident in the early morning hours on the Sunday before Thanksgiving. 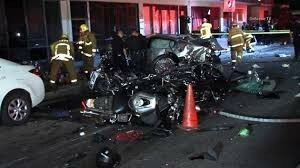 The alleged cause of the accident is a Los Angeles DUI incident. According to various news reports, the as yet-unidentified driver of a Buick LeSabre was speeding when he careened across West 59th Street near Normandie Avenue and slammed into a minivan containing a family of five. The accident killed the mother of the family, who was driving. The father and the three children, all under age 10, suffered minor injuries. A police officer on patrol saw the accident and responded quickly. Ambulance crews ended up transporting eight people to the hospital. One of the children in the minivan suffered a fractured bone. Police have not yet released the deceased mother’s name, but did identify the pedestrian killed in the crash as William Lamar Walker. The coroner’s office said that Walker was a youth football coach from Bell Gardens. Officers arrested the driver, whom they suspect of DUI. In 2013, the city had more than 2,300 people killed or injured in alcohol-related accidents, according to the California Office of Traffic Safety. A 2014 report from the California Department of Motor Vehicles said that 23 percent of all California DUI arrests occurred in Los Angeles County in 2010. If you need to develop a sound, systematic defense to a Los Angeles DUI charge, call experienced Los Angeles DUI defense lawyer, Michael Kraut, of the Kraut Law Group.